I love a good board game and it has become a sort of tradition that I buy a new one each year for the family to enjoy at Christmas. 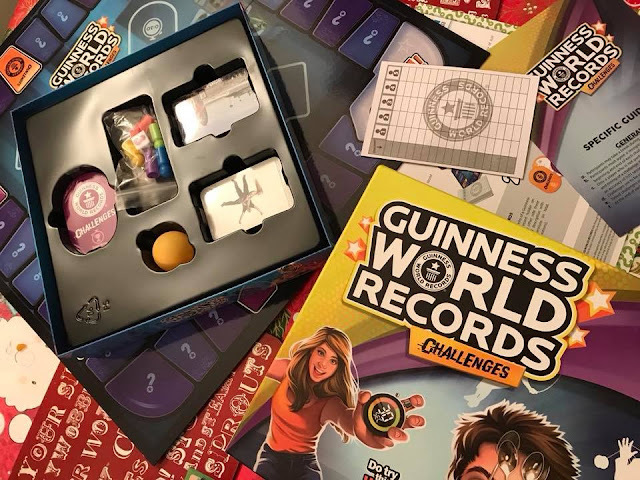 This year I was saved the effort of buying one when I was asked if I'd like to review the new Guinness World Records Challenges board game. I of course jumped at the chance. My eldest daughter has always been fascinated with the books so I thought it would definitely be one for the whole family to enjoy together. Do try this at home! Pick Your Challenge! 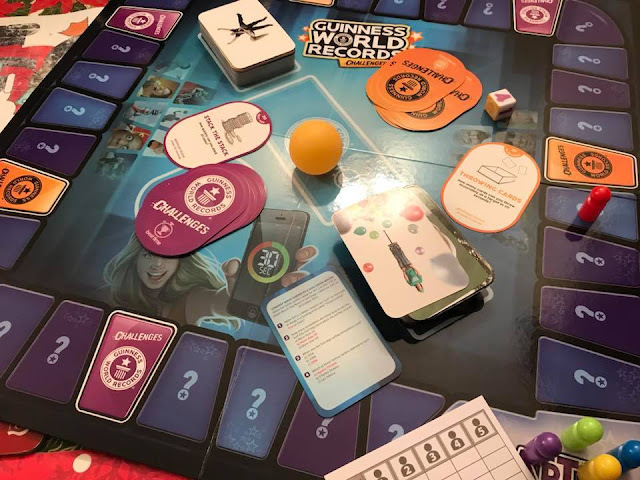 The idea of the game is to put each players knowledge about the Guinness World Records to the ultimate test as well as challenging opponents to try their best to demonstrate some record breaking skills and the best part is that it uses every day household items so it is fully accessible for anyone who chooses to play. Suitable for 2-5 players and aimed at people aged 8 and upwards, this game can be played as individuals or in a group. The aim of the game is to answer questions about amazing Guinness World Records and race around the board to earn the challenge cards. In order to win you need to be the first to cross the finish line with three challenges under your belt. 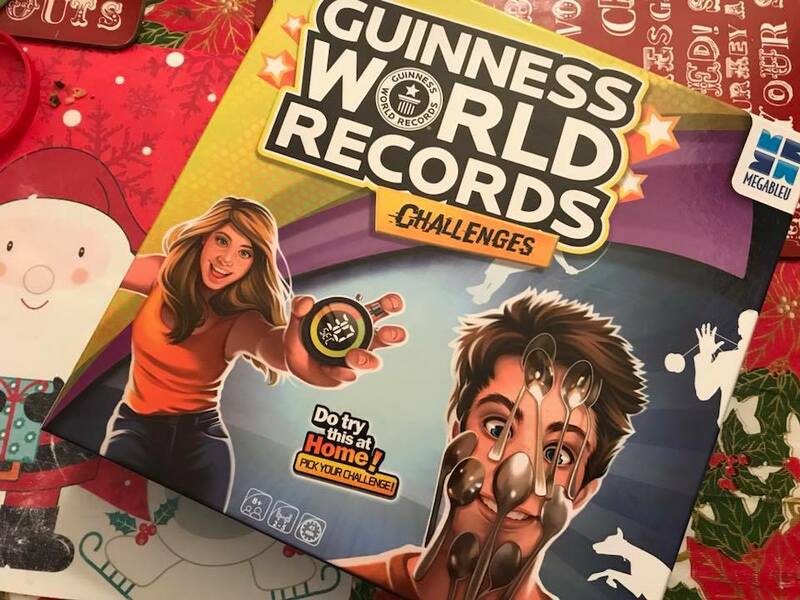 Challenge your opponents, display your skills and improve your knowledge of Guinness World Records! What I like is that is both a game of knowledge and a game of skills and the skills involved aren't all necessarily hard, they include: spoon balancing, wearing the most pairs of socks, flipping a bottle of water and many more! There is a great range which people young or old can get stuck into and it all makes for some hilarious viewing. There are two types of challenges. 10 orange '30 seconds' challenge cards and 10 purple 'best time' challenge cards. My personal favourite was the 30 seconds ones, it really is a race against time and there's also the added challenge of trying not to drop down on the floor laughing whilst attempting the challenges. The game itself can take around 45 minutes to an hour depending on questions and challenges picked but it's a great way to spend an afternoon and lets be honest you are learning things as you play so, improving your knowledge for the next time you might happen to play. Could also come in handy for that next quiz you attend too! Demonstrate your own record breaking skills! 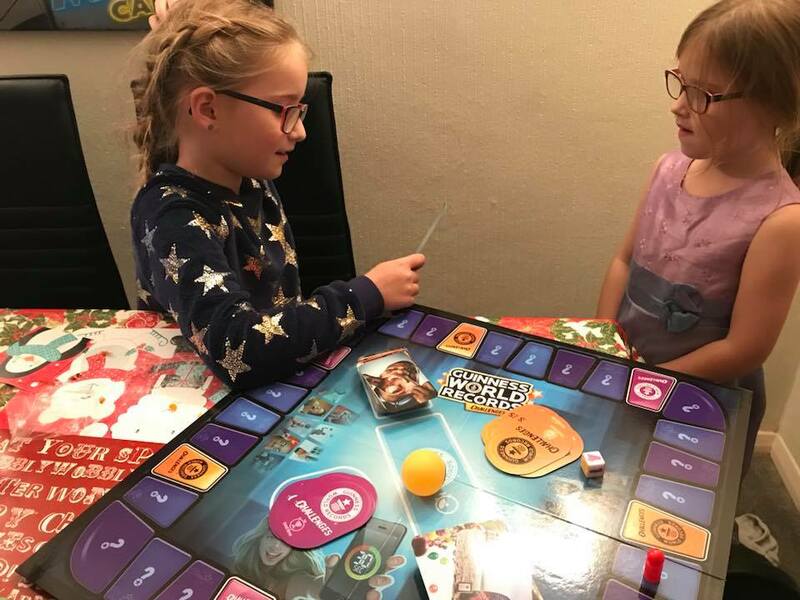 This is a wonderfully entertaining game, one that introduces the idea of team work to younger players, working together, cheering each other on. Simple to set up and easy to play, it makes for a brilliant activity to be played, especially over the festive period when families come together. Could you be a record breaker?